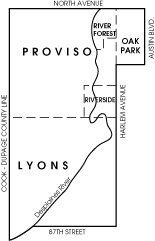 Oak Park, Proviso, Riverside, and River Forest townships and includes thirty one villages. Preserves, and 1 percent rural or undeveloped. within the five townships of the District.